Discover Parc Güell and more in Barcelona! 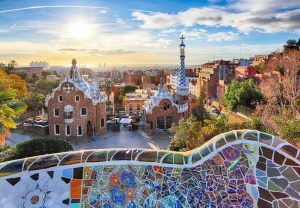 Travelers escape to Barcelona for warm weather, amazing food, and irresistible culture, but no trip to the Spanish city would be complete without a thorough tour of Antoni Gaudí‘s remarkable creations. Gaudí was born and raised in Barcelona, and over ten of his most famous buildings are found within the city lines. Prepare yourself for a day of history and adventure, and discover four incredible Gaudí buildings in Barcelona! Known as Gaudí’s masterpiece, Sagrada Família has been in construction since 1892 and isn’t expected to be complete until 2026! Sagrada Família pays homage to the traditional Gothic cathedral but features a geometric style specific to Gaudí. The artist devoted his last years to Sagrada Família, and visitors can feel the immense heart and soul that he poured into every aspect of the design. Once an old conventional house built in 1877, Gaudí transformed Casa Batlló into the ideal form of Modernisme (Catalan art nouveau). The exterior features a lovely display of ceramics, natural stone, forged iron, and a colorful mosaic known as trencadís. Casa Batlló also goes by the House of Bones, due to its abnormal skeletal design. The roof is scaled with fantastical, glimmering tiles, creating the illusion of a dragon’s tail flickering in the midday sun. Commissioned by Eusebi Güell in the early 1900s, Parc Güell is an elaborate garden complex that houses a series of Gaudí’s work. The park is the perfect example of the architect’s personal style, featuring imperfect shapes and irregular ceramic pieces. Visitors can easily spend the entire afternoon here strolling through nature and admiring the intricate artwork. Don’t miss the view of Barcelona from the terrace, featuring Gaudí’s signature trencadís in the foreground. From the outside, Casa Milá appears more mountain than building. Gaudí sought to reflect the irregularities of the natural world and to reflect that organic beauty through a human-made building. The exterior features a smooth mass of stone and forged iron balconies, but the most shocking feature is found on the rooftop. A huddled mass of statues resembling masked creatures stands tall on the roof of Casa Milá. For the best photograph, tour the Casa rooftop at sunset! Experience an exhilarating adventure in Barcelona on the Spanish Fiesta Tour and the Continental Tour! Check out the day-by-day itineraries, and give us a call for more information! This entry was posted on Wednesday, April 3rd, 2019	at 11:16 am	. You can follow any responses to this entry through the RSS 2.0	feed. You can leave a response, or trackback from your own site.